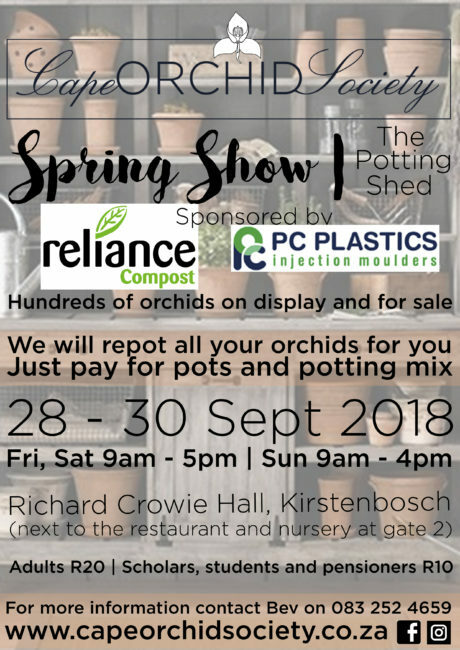 Join the Cape Orchid Society in spring for their themed show ‘The Potting Shed’. This show will display a bounty of unusual and exotic orchids and for sale as well as offering members of the public an opportunity to have their orchids repotted by some of the top orchid growers in the country. Repotting will happen all weekend starting from just R10. Bring your orchids along to the show and have them repotted while you check out the display or sales area. The members of the Society are happy to help collect your plants from the entrance gate if needed. Call the number on the poster displayed at the entrance gate for assistance.